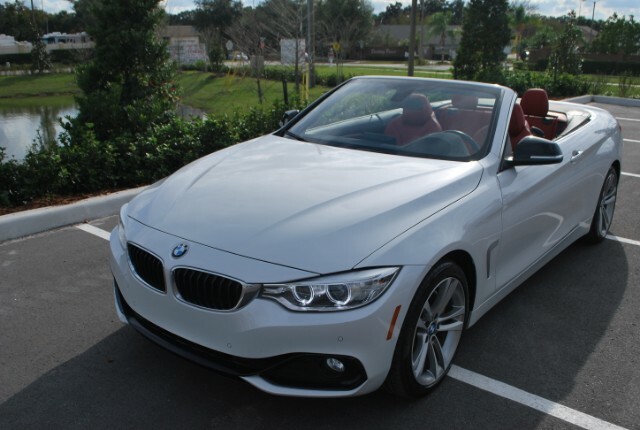 435i Sport Convertible! Mineral White with coral red leather. One Owner and in like new condition. Florida car and zero issues. 62K original Window sticker, options are: Sport Pkg, M Sport Suspension, Sport Seats, Fine wood Trim, heated Seats, Navigation System, Heads up Display, HiFi Sound w/ Expanded Smartphone, Park Distance Control, Xenon Adaptive Lights, Cruise control w/ Brake Function, Light Package, Sport Automatic Transmission, Sport Wheels, Comfort Access, Reverse Camera, Wind Deflector, Sport Steering wheel with paddle shift and deviated stitching. Call Todd @ 321-231-4690 for a quick response and visit us online @ TTHMotorgroup.com for more information. Trades are welcome!